This is the perfect lawn gnome to place near your vegetable garden. 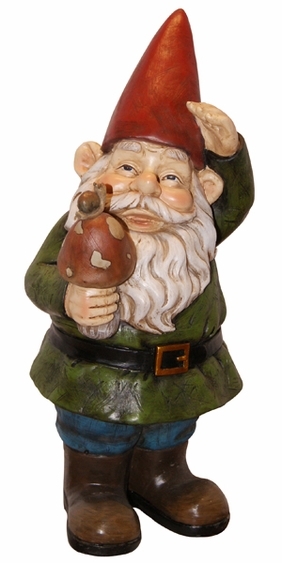 It's our Explorer Gnome who holds a mushroom in his hand that has a snail sitting on the top. Made from durable, weather-resistant cast resin, he's built to stay tough through whatever Mother Nature dishes out. At 12 inches high, he's the perfect size as a marker for a flower bed or garden area. See also our Explorer gnome with bluebird. Together they make a great team! Save Extra when you purchase the Pair of Explorer Gnomes!